StarWars.com Hosting Online 'Clone Wars' Marathon! StarWars.com Hosting Online ‘Clone Wars’ Marathon! As we head into our final long weekend of the summer at StarWars.com, we invite you to spend some time with the Zillo Beast and his friends. StarWars.com is winding down the summer with a marathon of five episodes from the second season of Star Wars: The Clone Wars. These cinematic spectacles offer widescreen, epic action worthy of a summer blockbuster: except in small screen, 22-minute format. So while you’re waiting for the September 17th premiere of the third season of The Clone Wars, revisit these fan favorites that are streaming through September 7th. This is really now what I would call a ‘marathon’. They have selected five episodes from the entire season of 22. At first I was encouraged that there were four in a row (16-19) … but then I realized they have excluded the finale. Maybe I am just a grumpy old man, but to me it feels like some blatant up-selling – tease you with a few free episodes and a lead-in to the new season without giving you the finale, in the hopes that you will go buy the DVD or grab the episodes on iTunes. I have to admit to giving up on the Clone Wars after season one – my kids didn’t make it to the finale and my wife used the time to catch up on reading, but this summer I have heard from several friends that Season Two was an improvement over the first season. Perhaps I will check out these episodes and see if it is true. * Extend the Fantasy: Kids no longer have to wait until the next exciting episode of Star Wars: The Clone Wars animated TV series to continue exploring and enjoying the Star Wars universe. With Clone Wars Adventures, kids can go online to experience exciting thrills as you duel iconic adversaries with your own custom lightsaber, speed through the galaxy in your starfighter, defeat enemies and take down starships. Adventure online to discover your destiny! * Play Free or Upgrade: Clone Wars Adventures is a free-to-play game, but players who want to take the galactic action to the next level can purchase a monthly membership. Players can also buy cool Star Wars universe items from within the game through micro-transactions using Station Cash. * Minigames & More: From Droid Programming to Speeder Bike Racing, Clone Wars Adventures puts you in the driver seat to experience epic action in immersive minigames that take you to your favorite locations in the galaxy. Become the proud owner of a tricked out Droid pet or throw a party in your player house – the fun is endless! 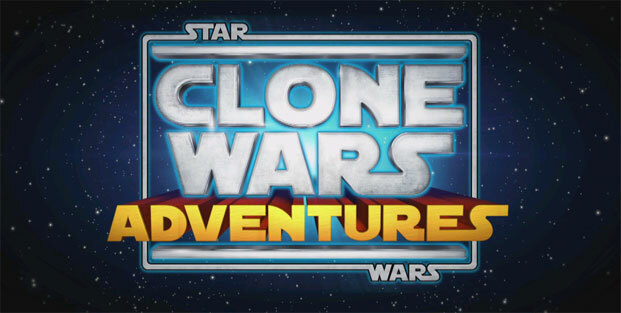 * Fun With Friends: Whether you are on adventures with old friends or competing for leaderboard status with new ones, Clone Wars Adventures is a lively virtual world that connects players in fun and safe ways. Show off your achievements in your Trophy Room, use safe chat and emoticons to express yourself and celebrate in-world events with the entire galaxy! * Embedded Card Game: Clone Wars Adventures card battles lets players pit a variety of fun characters, creatures and vehicles from The Clone Wars television show against one another in a unique, fast-paced combat similar to the gameplay styles of traditional games such as War and Concentration. * Kid-Friendly: Parental controls allow for the customization of safety options, including pre-canned chat and playtime settings for younger players. The game comes out mid-September, just in time to tie in to the new season. Have you kept up with the series? Or did George lose you back in 1999 with Jar Jar? What are your thoughts on these cartoon and CGI stories and also the upcoming online game?